1 of 1 Chop 3/4 cup honey graham sticks and fold into batter. To frost: Melt four 1.55 oz milk chocolate bars in microwave for 1 minute, stirring halfway. Stir until melted and smooth. Crush 1/2 cup honey graham sticks. Dip top of each cupcake in milk chocolate. Roll edge of cupcake in crushed grahams. 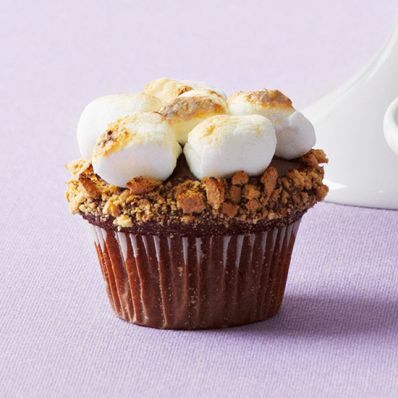 Top each cupcake with 4 or 5 mini marshmallows. Broil, 4 inches from heat, 1 minute, or until golden brown.